Obama and Putin. Getty Images (2). Obama dismisses Putin, but Czar is getting the better of us again and again. By Ralph Peters. New York Post, April 23, 2016. To pinched-nostril commentators in the West, Vladimir Putin, Czar of all the Russias, is a boorish clown destined for ultimate failure. To me, he’s a genius. I don’t like the guy one bit. But I have to respect his abilities. The last time a minor power played its hand as well as Putin has played Russia’s was in 1203. Venice hijacked the Fourth Crusade to sack Christian Constantinople, leaving Venice wealthy and empowered. It also wrecked Europe’s bulwark against Islam, leading to seven centuries of jihad (resuming now, after a brief timeout). Putin’s power plays won’t end well for Europe, either. But, like medieval Venice, he’s good at what he does. The Czar on his throne. Putin by Platon for Time Magazine, 2007. 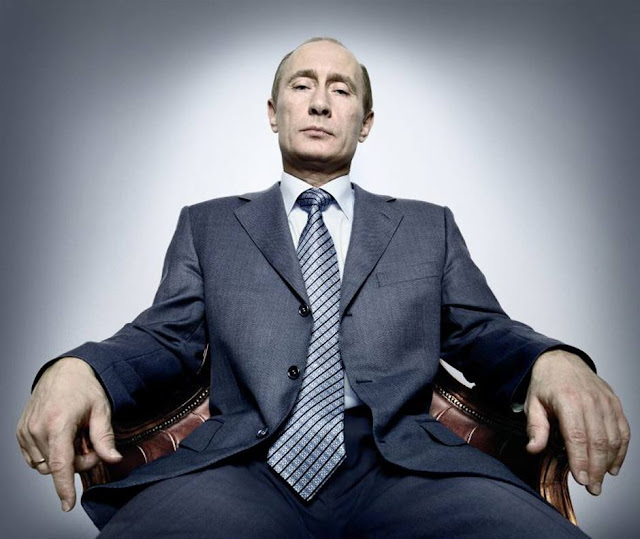 Taking over when Russia was flat on its back, Putin restored Russian pride, recreating the trappings of a great power. One of his key advantages has been precisely what effete Western commentators see as a weakness: He lacks credentials. He didn’t go to the right schools and doesn’t behave properly. He was a “lowly” KGB lieutenant-colonel. He’s crude. So our prissy elites spent the last decade and a half mocking Putin. He spent those years enriching his country, reviving its military, expanding its territory, extending its influence abroad — and humiliating the United States of America. Our diplomats play contract bridge while nibbling delicate sandwiches. Putin plays pistoled-up five-card stud. And he cheats. Putin punished Georgia, reclaimed Crimea, invaded eastern Ukraine and — just this month — he rekindled the fighting between Azerbaijan and Armenia to bludgeon oil-rich Azerbaijan away from its flirtation with the West. Putin has backed Iran and is arming it with late-model air-defense missiles that will make any US or Israeli strike painfully costly. He intervened successfully in Syria, smashing America’s feeble clients, generating another wave of refugees to further disrupt the European Union and leaving “President” Bashar al-Assad more securely in power than he’s been since the uprising started. He’s punching way above his weight when it comes to NATO, too. With one dangerous provocation hard on the heels of another, he shows no sign of backing off. Rather, he’s having a high old time embarrassing the United States and its president. On Thursday, his representative to the first NATO-Russia council in two years cynically turned the situation on its head, claiming that the US was the aggressor in every encounter — including that danger-close fly-by of a US destroyer in the Baltic. Putin’s man chastised our Navy for its recklessness. He sends a message to Russians that it’s the American military, not Russia’s, that’s hollow and rotten. It’s great propaganda that titillates Ivan and Olga (the latter almost as much as his bare-chested selfies). His intelligence collectors study our electronic systems as they track the older jets that he sends out (he won’t reveal the signatures of his latest aircraft). He accustoms us to aggressive behavior, conditioning us not to “overreact.” Were it to come to a sudden war in the 21st century, the side that pulled the trigger first would win. He’s training us to hesitate. The Russians are well aware of the low morale in our scandal-plagued Navy. On top of that, they watched, enthralled, as the Iranians grabbed and tormented our sailors — only to be thanked by our secretary of state for resolving the crisis they created. Now the Russians believe that they can get away with anything, as long as Obama’s in office. And in those famous words from the 1968 Democratic convention, “The whole world’s watching!” Putin doesn’t care what our elites think of him. He plays to a global audience. And that audience sees him as bold and successful, while it sees us as afraid and ineffective. Of course, the DC establishment’s last-ditch defense of the “wisdom” of our feckless response to Putin is to conjure the spirits of economic disaster, the insistence that, while Putin’s a pain, the Russian economy’s tanking and he won’t be able to sustain his mischief much longer. Well, Putin’s economy took a body blow, thanks largely to the drop in oil prices and partly because of (now wobbling) Western sanctions. But the ruble and Russia’s foreign reserves have stabilized. Import substitution is progressing. The oil price is inching back up. Russians are much better off financially than they were before Putin appeared, and — most important of all — Russians expect life to stink. Deprivations that would shock Americans don’t even register. And Putin’s stage management of the economic downturn has been masterful. His popularity rating remains higher than Hillary Clinton’s and Donald Trump’s combined. Putin put that myth on TV and online. His four-hour “audiences” are brilliant theater. He takes calls and e-mails complaining of Russia’s immemorial problems: bad roads here, corrupt bosses there, unpaid wages in a cannery. With barely a hand wave, the people’s woes go away. When will we stop underestimating Putin? 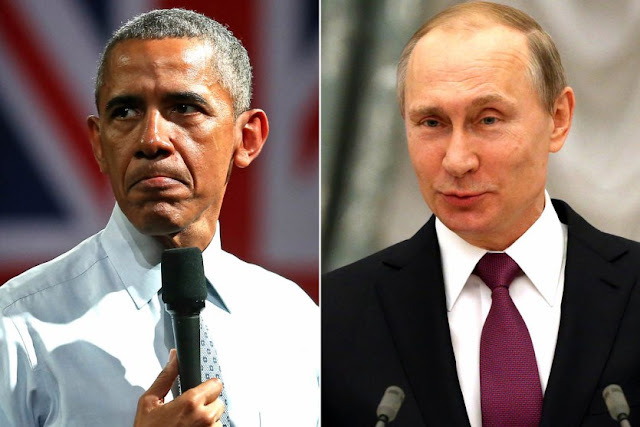 Western leaders have come and gone, but Putin’s still there. Barring acts of God, he’ll remain on his throne after the next two or three US presidents have left the Oval Office. And now he’s accustomed to winning. To repeat myself from past columns, Putin has no reverse gear. He keeps going forward until he hits a wall.